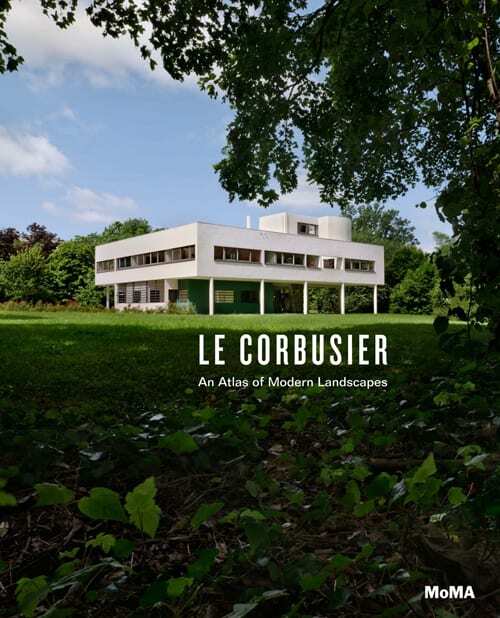 Le Corbusier: An Atlas of Modern Landscapes. Exhibition organized by Jean-Louis Cohen with Barry Bergdoll. Museum of Modern Art, New York, June 15–September 23, 2013; Caixa Forum, Barcelona, Spain, January 28–May 11, 2014; Caixa Forum, Madrid, Spain, June 10–October 12, 2014. 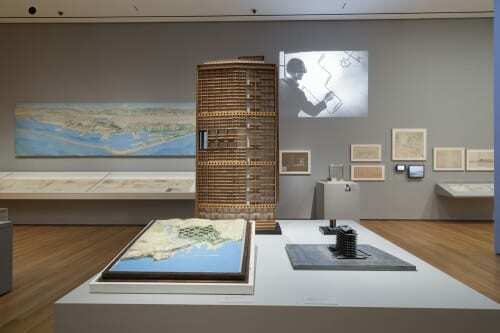 On view at the Museum of Modern Art, New York, June 15 to September 23, 2013, Le Corbusier: An Atlas of Modern Landscapes was expansive, densely packed, exhaustive, and, similar to past architecture shows organized by MoMA’s former Philip Johnson Chief Curator of Architecture and Design Barry Bergdoll, rewarding but exhausting. 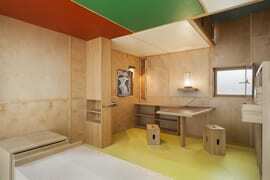 With more than three hundred twenty objects, including drawings, paintings, maquettes, films, found objects, and reconstructed interiors, the show did not so much redefine the illustrious career of the Swiss-born French architect Le Corbusier (1887–1965, né Charles-Édouard Jeanneret-Gris) as play out the earthy side of the man—curves and crags rather than right angles and smooth surfaces. The show gave primacy to the Swiss Jura instead of the French dalle, asymmetrical mountains over artificial ground data, while, in reality, it is the latter that would ultimately have greater material presence in the architect’s oeuvre. That la dalle, or the plinth, was elemental to Le Corbusier’s practice but not framed as catalytic here, however, does not mean the show’s focus on the natural landscape was off base or wrong-headed. Rather, what emerges from this broad overview of the land and site in his work is a rethinking of the hardness of such artificial surfaces. We find a union of the soft and firm—a warm and tactile sense of cold architectural construction—bodying forth from the exhibition. Or perhaps I should say, such a union rallied forth from the body itself, as this exhibition suggests (even if ever so slightly) a turn toward a revisionist, body-based modernism. Bergdoll and guest curator Jean-Louis Cohen, a professor of architectural history at New York University, resituated Le Corbusier’s modernism in terms of the ground plane, i.e., site-specificity and place. This review, like the show, pivots according to two primary terms: landscape and revisionist modernism. Situating this resituating, as it were, is no easy task. There have been no remarkable trends in either area—landscape and ecology, or revisionist modernism—of architectural discourse lately. There have been, perhaps more simply stated, some important mile markers. First, thus, a lay of the land . . . In the realm of “landscape,” the Cooper Union hosted an exhibition on a related topic, Lessons from Modernism: Environmental Design Considerations in 20th Century Architecture, January–March 2013. On the West Coast, several exhibitions focused on the site-specific nature of modern architecture in Los Angeles as part of the omnibus curatorial extravaganza Pacific Standard Time, April through September 2013. Most topical of all, the book The Modern Architectural Landscape (University of Minnesota Press, 2012) by Caroline Constant, who spoke in September at the MoMA symposium connected to the exhibition, looks to earth and environment in Le Corbusier’s work as well as in that of other moderns, including Mies van der Rohe, Erik Gunnar Asplund, and Jože Plečnik. There is very little in the way of a broad movement of revisionist modernism currently underway. We might nonetheless look to Lukasz Stanek’s edited anthology, Team 10 East: Revisionist Architecture in Real Existing Modernism (University of Chicago Press, 2014), for a will to reframe modernism. Stanek’s book follows after more than a decade the overt attempt at category-busting in Anxious Modernisms: Experimentation in Postwar Architectural Culture (2001), edited by Sarah Williams Goldhagen and Réjean Legault. Prior to such accounts, we must look deeper into the past to find instances of late and hybrid modernisms, such as those as offered up in Reyner Banham’s Architecture of the Well-Tempered Environment (University of Chicago Press, 1969) and Leo Marx’s literature-based The Machine in the Garden: Technology and the Pastoral Ideal in America (Oxford University Press, 1964). Then there is the ever-vibrant discourse of territoire/territory in Europe, which seems to be the closest approximation of an ongoing trend in rethinking modern architectural and planning initiatives in landscape, region, and environmental transformation. In the last two years alone, there have been exhibitions of the work of the French architect Dominique Perrault, of Flemish architecture and the Belgian landscape, and of contemporary art, collecting, and regional architecture practices, all of which were organized under the theme of territory. To locate the strongest, most palpable instance of modernism after modernism in the present moment, one must look outside the confines of conventional architecture and urban practices. Rather than revisionist modernism, the equally lively contemporary art, design, and theory practices of media and new media art constitute a striking instance of nonstop modernism—i.e., modernism that never quit. The interactive media work of architect-artists such as Philip Beesley, Manuel Kretzer, and Ted Krueger are part of the continuation in the twenty-first century of Bauhaus light-art and mid-twentieth-century kinetic sculpture and early digital art. Where do the themes of landscape and revisionist modernism within Le Corbusier: An Atlas of Modern Landscapes fit in this overview of our current moment? The show falls somewhere along the edges, rather than at the center of any of these beginnings. This non-edgy edginess tells plainly this: Bergdoll and Cohen are not trailblazers or avant-gardists seeking to revolutionize Le Corbusier but wise and strategic keepers of Le Corbusier’s myth, legend, and reality. They retell the story of Le Corbusier’s practice markedly not in the more loaded ideological terms of “ecology,” “environment,” or “nature,” but according to the slightly pallid term “landscape.” With its deep connections to classical training in architecture (by way of sketches made during the Grand Tour) and to classical training in painting (by way of Claude Lorrain, Jean-Baptiste-Siméon Chardin, and Jean-Baptiste Greuze), landscape safely, that is, nonpolitically, shines the light of newness on Le Corbusier. This was not a political show, neither a prise de parole for global warming nor a cri de coeur for the Kyoto Protocol. While not taking an overtly green or even ideologically ecological stand, the stakes were, at the same time, implicit enough. With melting glacial poles weighing on the collective consciousness and the limitations of petroleum pressing, it is the right time for a Le Corbusier of the landscape. At the same time, the idea that those who know and love Le Corbusier would have ever located him far from landscape is preposterous in the first place. His work was always about landscape, its many splendors, artificial and otherwise. Cohen looked precisely to this condition, reframing Le Corbusier according to a dynamic, protean, and manmade conceptualization of the landscape. In an essay in the compendious exhibition catalogue, Cohen writes about landscape in Le Corbusier’s work as a matter of both soil and sand, grounded and aerial, tactile and acoustic. He explains, “Landscape’s most fertile role in Le Corbusier’s thinking retained nothing of the literal; it involves neither geographic interpretation nor landscape’s active or reactive presence in his project. Landscape was edifying . . . because it generated analogies and metaphors, figures of speech that had immense importance in all of his work, as his most provocative aphorisms such as ‘The house is a machine for living in.’”1 As hard surfaces reveal their fleshy underbelly, so too does the machine show its humanity. The sprawling exhibition was organized around four themes, creating an intermittently linear narrative to the show: the landscape of found objects, domestic landscape, architectural landscape of the modern city, and vast planned territories. The curators launched the exhibition with a Janus-faced symbol: a reconstruction of Le Corbusier’s getaway cabin on the shores of the Mediter­ranean, the Cabanon from Roquebrune-Cap-Martin (1951–52), where Le Corbusier conceptualized his later work and where he died. It is a small and simple space with bark-covered exterior planks and a casually appointed interior, and with rustic modern furniture crafted by the carpenter Charles Barberis. The cabin was a small space for big ideas, where the architect escaped to chisel away at projects as part of the ongoing process of the thinking and rethinking of architecture. This reconstruction offers a modern approximation of the primitive hut on the frontispiece to Marc-Antoine Laugier’s Essay on Architecture (1755). Like Laugier’s hut, and, for that matter, the trope of the primitive as it wandered its way through modernism of la longue durée, Le Corbusier’s Monte Carlo rustic cabin is a symbolic space intended to catalyze intellectual and creative apertures—openings to the new. Beyond this point the exhibition wended its ways through the life of Le Corbusier primarily by way of objects—a notable and important quality of the exhibition. While there were plenty of architectural renderings, they were, largely speaking, a minority. There were many sketches but few instrumental drawings. Le Corbusier’s “stuff” is far more present in the show, including furniture, small and large architectural and urban models, and films, but also the glassware that apparently inspired some of his Purist paintings from the early 1920s, the “Objects of Poetic Reaction” (shells, bone, tree bark) that inspired his Léger-influenced paintings of the late 1920s, and of course many of the actual paintings. These objects functioned as muse-like objects of allure. As they invited unwarranted touch, they underscored the tactile side of the architect’s greater artistic practice, pointing as well to the many paintings in which they appear. The emphasis on the everyday things of his life is ideological in a productive way: it helps to define landscape as quotidian and a matter of philosophical materialism. In the portion of the exhibition devoted to his early development in the Jura Mountains of Switzerland, for example, the walls were covered with the perspective drawings, small sketches, and midsize watercolors by Le Corbusier and the large paintings of his teacher Charles L’Eplattenier, but notably few other architectural drawings. Without plans or axonometrics of the Villa Jeanneret-Perret or Villa Schwob, Le Corbusier reads in this entry space of the exhibition as sensuous and affective rather than cerebral and rational, a designer of landscape and feeling rather than hard transaction. The film clips, contemporary panoramic photographs of existing projects, and an ancillary but fresh organizational theme of “airplane views” undergird the soft and fuzzy interface between technology and the mortal coil. Shot by Le Corbusier in the 1930s and recently discovered, silent films evinced the centrality of play in his design, showing young people moving energetically through his white cubic architecture. Smiling, lithe, and clad in bathing suits, they exercised in small groups, racing up and down ramps. Commissioned especially for the show, Richard Pare’s panoramic photographs of Le Corbusier’s work in the present offered an unexpected counterpoint to the many and sometimes leaden artifacts of the show. Pare’s long, tight photos of seven projects—made from digital files based on negatives—functioned as a twenty-first-century respite in the world of contemporary technology. Hung high above the din of the objects below, they looked from afar like sharp photorealist paintings or high-definition screens. Pare’s photographs invigorated Le Corbusier’s work in ways perhaps unforeseen, with shots of color pixels making for a touristic sense of real-time viewing. Further rethinking the view from afar, the curators’ emphasis on the airplane as a writing tool serves to reposition the totalizing Gestalt of the modernist plan-masse. Rather than cool, rational, and popping forth in full form from the head of a genius, this was modernism as tactile and in-process: a matter of the human-machine in motion and the prosthetic. In a catalogue essay, Bergdoll expands this sentiment through Le Corbusier’s love of the airplane: “Airplanes were an integral part of the way he conceived of his buildings as instruments for crafting both optical and bodily relationships to landscapes; the notion of the landscape encompassed everything from the physical occupation of an interior to the projected occupation of an exterior framed by any number of devices.”2 The landscape as a theme in Le Corbusier’s work was truly fathomless: a matter of mountains, cars, concrete, and otherworldly imaginings. At the same time, each landscape generated a dialect of precision and homogeneity. In the small watercolor Landscape of Lake Geneva (1918), the Swiss mountains are evanescent though very real and site-specific. By contrast, his proposal for the Palace of the League of Nations in Geneva (1927) shows a complete complex of buildings, a totalizing plan-masse that could have been anywhere. In an axonometric view from the west, there is not a single mountain in view. Following a similar pattern of variations on a theme, São Paulo, Rio de Janiero, and Algiers became would-be locales for sinuous architectures born from seemingly bland automotive infrastructure. While our collective caricature of the automobile is that it wreaks homogenous havoc in its wake, for Le Corbusier it was a way to sculpt the landscape and create unique and mesmerizing architecture and experiences for drivers, so many earthbound cyborgs. Parsing Le Corbusier’s lifework into periods, the exhibition knit tightly together the beginning and the end, leaving his middle career as not so much an afterthought but simply part of the systemic passage-through. From this perspective, the placeless, diagrammatic Do-mi-no House (1914) culminates not in the Maison Citrohan (1920–22) or the Quartiers Modernes Frugès at Pessac (1924–26), but in the sublimity of the Philips Pavilion (1958) at the Exposition Universelle in Brussels, with the schematic simplicity of the former coming to full fruition in the fierce yawp of angular and sonic form that was Le Corbusier and Iannis Xenakis’s poème électronique. Charissa N. Terranova is the author of Automotive Prosthetic: Technological Mediation and the Car in Conceptual Art (University of Texas Press, 2014). She teaches the history of contemporary art, modern architecture, and media and new media theory at the University of Texas at Dallas. She is currently writing a prehistory of the digital image in art, Art as Organism: Biology and the Evolution of the Digital Image in Art, 1920–1970 (forthcoming from I. B. Tauris, London). It traces the role of cognition, Gestalt psychology, and theoretical biology in the unfolding of an aesthetic and philosophy of the light-image. This review originally appeared in the Summer 2014 issue of Art Journal.